B4C and W-films in order to connect the electrodes. To be most sensitive to the surface, the experiment was performed in grazing incidence geometry (a). 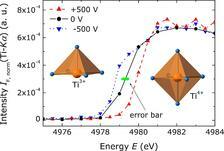 Perovskite-type crystal structure of STO at room temperature (b). Figure 2: XANES spectra for photon energies at the Ti-K absorption edges under application of a DC electric field. Oxygen (small blue spheres) coordination polyhedra of Ti (large orange spheres) cations are illustrated. Strontiumtitanate SrTiO3 (STO) is a prototypical perovskite, a class of substances, which find wide applications based on their interesting ferroic properties. STO itself is not ferroic, but it is used as a substrate for many perovskite thin films due to its well matching lattice constant and its chemical inertness. However, STO also has an interesting property: Upon the application of an electric field, structural changes and a degradation of the surface are observed. This can be explained by mobile oxygen vacancies. Therefore, X-ray absorption near edge structure measurements of STO in an electric field were performed in grazing incidence geometry. Density functional theory calculations were used to explain the data. During the last decade, extensive scientific research has focused on materials exhibiting ferroic properties – ferroelectrics, ferromagnetics and ferroelastics. The ferroic properties arise from a spontaneous long-range ordering of electric dipoles, magnetic moments or deformation moments. Important characteristics of these materials are, among others, piezoelectricity, which is used for e.g. conventional lighters, pyroelectricity, which is used for e.g. temperature sensors, or giant magnetoresistance, an effect, which is used in every day data storage devices. If these characteristics are coupled, a large diversity of upcoming applications, e.g. micro electro-mechanical systems, magnetoelectric transducers, ferroelectric field effect transistors as well as data storage and random access memory devices is possible. Among (multi-) ferroic materials, oxides with the perovskite-type of structure have gained great importance due to their comparably straightforward synthesis and controllable diverse properties. Pristine STO is characterized by a perovskite-type cubic structure (Fig. 1) at room temperature (RT) and exhibits no ferro- or piezoelectric behaviour down to helium temperatures. The growth as well as processing of oxide single crystals, such as STO, introduces a specific density of Schottky point defects. Although several defect-reducing approaches are utilized, in particular near-surface regions still exhibit a distorted structure . Essentially, statistically distributed or periodically arranged oxygen vacancies show a strong impact on structural and electronic properties, e.g., phase transitions, ionic conductivity and resistance switching . Application of a static (DC) electric field to a STO crystal results in a redistribution of oxygen vacancies and subsequently in structural changes [2,3]. It has been suggested that either oxygen vacancies or SrO complexes gain an enhanced diffusion coefficient when transported along dislocation lines or planar defects. Recently, for (001) STO wafers we have found a reversible change of the X-ray reflection profiles using Wide-Angle X-ray Diffraction under application of a DC electric field at RT . This phenomenon has been attributed to structural variations observed beneath the anode and promises application in the field of adaptive X-ray optics . In order to identify the atomic species, which are responsible for the observed structural changes, we focused on the characterization of STO under the influence of an electric field in situ at RT. We performed dedicated XANES investigations at the Sr-K and Ti-K absorption edges using a (001) STO single-crystal plate with electrodes (Fig. 1). An electric field of E = ±106 V/m parallel to the  direction was applied. This experiment allows investigating changes of the valence states of the Sr and Ti atoms based on the binding energy of the resonantly excited 1s K-shell electrons. The in situ XANES spectra indicated an unchanged oxidation state of the Sr atoms under the influence of the electric field. In case of the Ti atoms, a significant shift of the Ti-K absorption edge energy of (1.29 ± 0.05) eV due to the electric field of varying polarity was observed (Fig.2). A qualitative interpretation of the results was drawn in terms of ionic conductivity. By applying a voltage of positive polarity to the sample surface, oxygen is forced to migrate from the bulk to the anode so that it compensates the intrinsic oxygen vacancies in the near-surface region. Thereby, the coordination of Ti atoms changes (Fig. 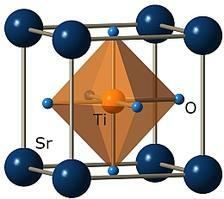 2) and the formal Ti valence state shifts from Ti(4-δ)+ next to a vacancy back to Ti4+. Hence, the ideal SrTiO3 structure is recovered in the near-surface volume. Inversion of the polarity reverses the oxygen anion transport, implying a change of the formal oxidation state from Ti4+ to Ti(4-δ)+. Density functional theory provides a quantitative basis for the observations made. The influence of neutral oxygen vacancies on the Ti 1s core level was calculated for a vacancy-containing supercell. 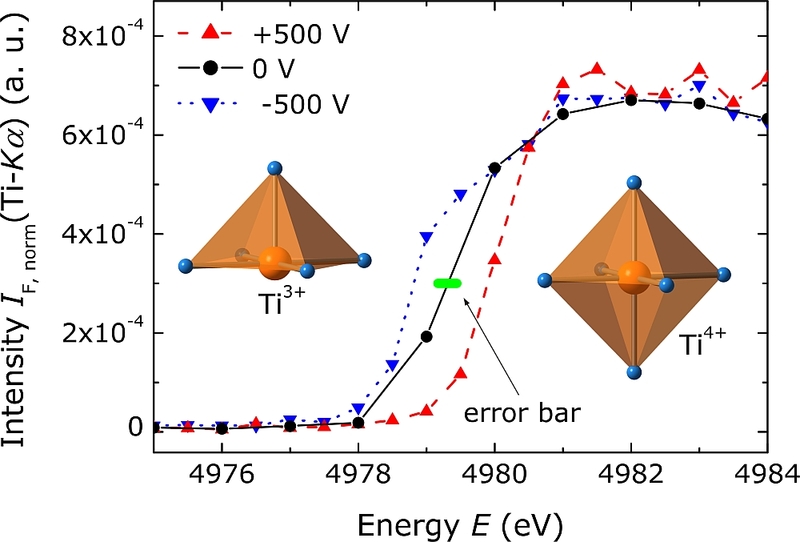 We obtained a reduction of binding energy of 1.1 eV for the Ti atom near the vacancy, which reflects very well the experimentally observed shift of the Ti-K absorption edge energy. In conclusion, XANES measurements proved a shift of the Ti-K absorption edge energy of STO under applied DC electric fields. A controlled switching of the Ti valance may give rise to a large variety of interesting applications and physical phenomena, e.g., dedicated valence states for controlled catalytic behaviour on STO surfaces or tuning of superconductivity, insulator-to-metal transition or magnetic behaviour connected to the Ti atoms . K. Rabe, Ch.H. Ahn, and J.-M. Triscone (Eds. ), "Physics of Ferroelectrics: A Modern Perspective" (Topics in Applied Physics), Springer, Berlin, No. 105 (2007). K. Szot, W. Speier, G. Bihlmayer, and R. Waser, "Switching the electrical resistance of individual dislocations in single-crystalline SrTiO3", Nat. Mater. 5, 312 (2006). E. Hegenbarth, "Die Feldstärkeabhängigkeit der Dielektrizitätskonstanten von SrTiO3-Einkristallen im Temperaturbereich von 15 bis 80 °K", phys. status solidi 6, 333 (1964). D.C. Meyer, A.A. Levin, S. Bayer, A. Gorbunov, W. Pompe, P. Paufler, "An electrical field-induced structural effect in strontium titanate at room temperature", Appl. Phys. A 80, 515 (2005). D.C. Meyer, A.A. Levin, T. Leisegang, E. Gutmann, P. Paufler, M. Reibold, W. Pompe, "Reversible tuning of a series of intergrowth phases of the Ruddlesden-Popper type SrO(SrTiO3)n in an (001) SrTiO3 single-crystalline plate by an external electric field and its potential use for adaptive X-ray optics", Appl. Phys. A 84, 31 (2006). K. Potzger, A.A. Levin, A. Shalimov, J. Osten, D.C. Meyer, J. Phys. D (2009) submitted.